Extinction is the final and irrevocable end of a species, and the fate of most living things throughout the earth’s history. Many of New Zealand’s native animals have been lost since people arrived – including the hefty moa and the lovely huia, and a host of less familiar species. 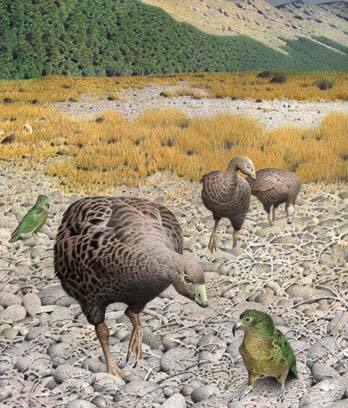 We may just be able to save the takahē, the saddleback and other creatures that are hovering on the brink. Extinction is the disappearance of an entire species or group of plants or animals, such as the dinosaur. Of all the things that have lived on earth, most are now extinct. People only realised that animals sometimes become extinct about 200 years ago. We know about extinct animals from looking at their bones or fossils. Extinction can be caused by many things. Sometimes the earth’s climate gets colder or hotter, and the plants and animals cannot survive in the new climate. move to new lands, bringing animals that sometimes kill off the ones that were there before. New Zealand used to have many animals that no longer exist. This includes species of birds, frogs, lizards, beetles and snails. Many became extinct soon after humans first arrived in New Zealand around 700 years ago. Moa were very large birds that could not fly. They were hunted to extinction by Māori, before Europeans came to New Zealand. There were many other birds that became extinct, including native geese and ducks. Europeans brought new predators that caused more species to become extinct. The huia was a beautiful bird that was extinct by the 1920s. New Zealand has many plants and animals that are in danger of becoming extinct. There are many things people are doing to prevent extinction. For example, they move endangered animals to islands and other places where there are no predators such as rats or cats. Some New Zealand birds have been saved from extinction, but still need protection. They include: the kiwi, takahē, kākāpō, and the North and South Island saddlebacks.